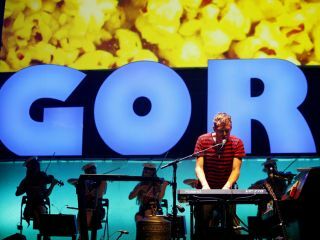 Damon Albarn plays a Roland synth on stage in New Jersey, but the new Gorillaz album was an iPad-only project. Damon Albarn suggested several weeks ago that the next Gorillaz album would be created completely on an iPad, and now it's been revealed that this will be released for free on Christmas Day via the band's online advent calendar. Speaking to Australian newspaper Perth Now, Albarn's Gorillaz co-conspirator Jamie Hewlett said: "On Christmas Eve a video for one of the new songs from the iPad album will be released. Then, on Christmas Day fans get the whole album downloaded to their computer for free as a gift." Albarn, meanwhile, confirmed that the new album was very much a product of spontaneity: "I literally made it on the road in America over a month," he said. "I didn't write it before, I didn't prepare it. I just did it day by day as a kind of diary of my experience in America. If I left it until the New Year to release it then the cynics out there would say 'Oh well, it's been tampered with', but if I put it out now they'd know that I haven't done anything because I've been on tour ever since." Gorillaz haven't confirmed which apps were used in the album's creation, but it'll certainly be interesting to hear how it sounds. As a side note, we pity the poor IT staff who'll have to on call on 25 December to make sure the Gorillaz advent calendar remains operational.